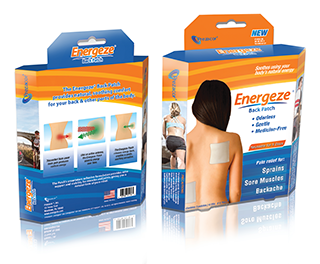 Prezacor®’s all new Energeze Back Patch provides odorless, gentle and medicine-free relief for aches and pains. Why Use the Energeze Back Patch? Comfortable & Easy to Use – The Energeze Patch uses a proprietary skin-friendly adhesive that is easy to apply and painless to remove. It will keep its shape during daily activities, and can be removed, re-positioned and reused for up to 5 days. Gentle, Odorless Formula – The unique Energeze formula does not contain menthol or any other odor-producing chemicals, so you can wear it under your clothes all day without drawing attention. No Drugs, No Side Effects – The Energeze Patch is an all natural solution to restore, relieve and re-energize your body, providing gentle relief for back pain and other ailments. It doesn’t contain any medicine, so there are no side effects to worry about. Versatile – You can reuse the Energeze Patch for up to 5 days during your normal daily activities – work, play and rest – with and instead of other pain management therapies.